Wedding Ring Sets for Her: How to Wear Them and Our 10 picks! A wedding ring set consists of an engagement ring and a matching wedding ring band. The main reason we like a wedding ring set is that the engagement ring and wedding band have been designed and made to be worn together. 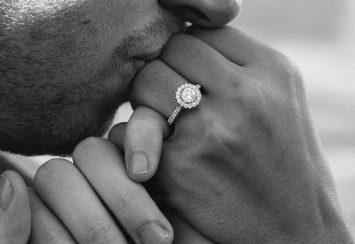 Whether your engagement ring features a particular diamond, gemstone or color, by opting for the set, your wedding band and engagement ring will fit nicely together. 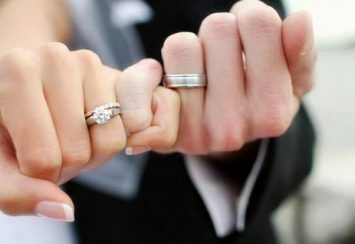 The great thing about a wedding ring set is that the two rings have been designed and created to enhance one another. 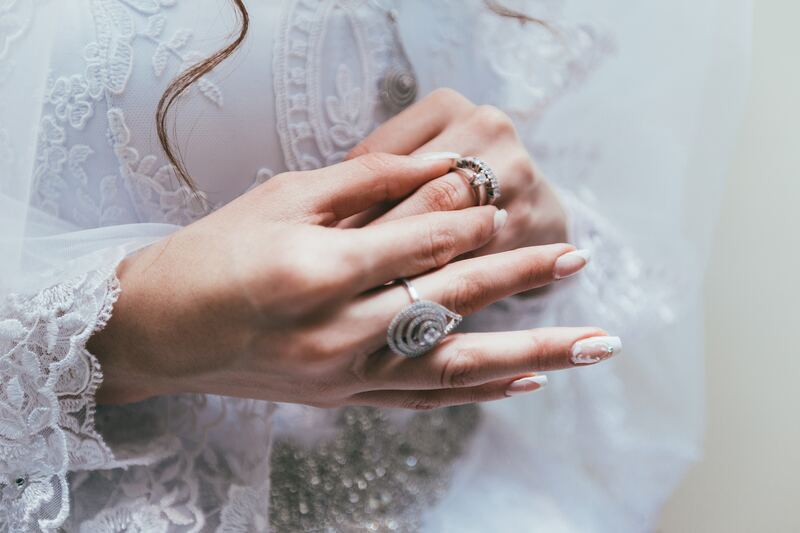 If you decide to buy an engagement and a wedding ring from different suppliers, you may underestimate how difficult the process of finding two rings that match each other is. 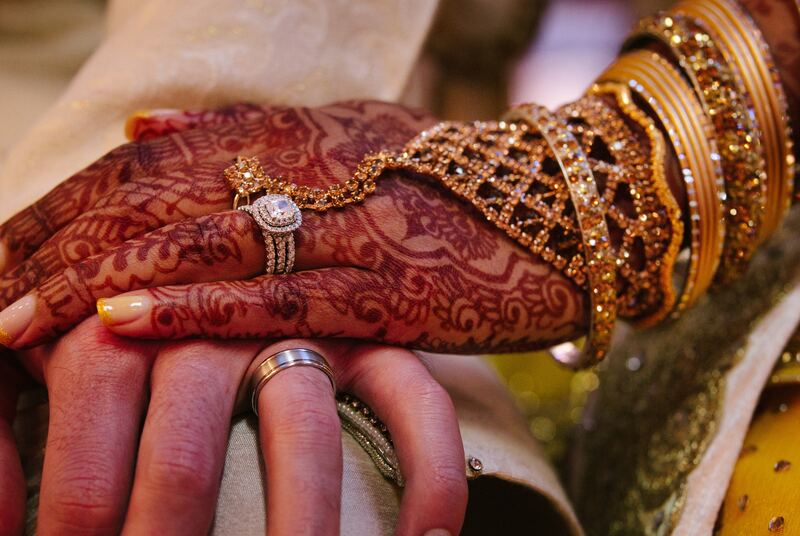 Each individual engagement ring will be made using a unique diamond or metal type. 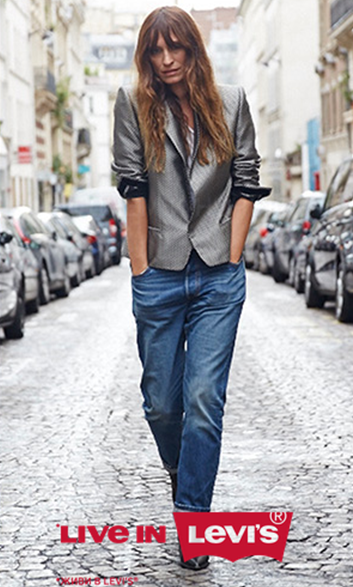 This could vary from yellow gold, white gold or rose gold metal. So it may be difficult to match the two rings exactly, if you decide to buy them separately. This is why we love the wedding ring set! It’s the easier option and at times can actually be cheaper because you’re buying two rings for the price of one. It’s also important not to underestimate how difficult the process of finding a wedding ring to match your engagement ring, can actually be. Plus, it’s important that your set is both made from the same metal. If you wear a white gold engagement ring next to a platinum wedding band, over time you may find that the platinum rubs against the white gold and actually damages your engagement ring. This is the last thing you want to happen! By opting for a wedding ring set, you can rest assured that the two rings will be made from equal metals so won’t damage each other. To start off our list we thought we’d start with this stunning engagement and wedding ring. The engagement piece has been designed with a circular diamond in the center of the ring and smaller diamonds around the edge. The sparkling gems then continue along the band, creating a sea of sparkles. When it comes to the wedding ring band, this contains smaller gems which are displayed in a crisscross design. This set has been made from an 18k gold plated sterling silver metal. 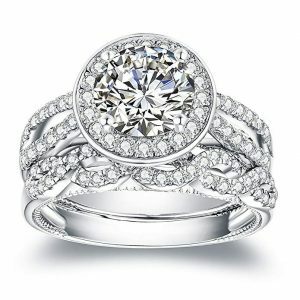 The designer has also plated the ring with platinum which gives it a smooth and brighter surface. It also strengthens the band. When it comes to the jewels used on this ring set, there are plenty of them. They may look like real diamonds but in fact both rings include zirconia diamonds which have been held in place securely by a four prong setting. They have also been cut to a round shape and weigh approximately two carats. What’s great about this set is that they look great worn separately but when worn together they look like one complete ring. This is mainly down to the type of diamonds featured in the ring and the diamond setting. If you’re looking for a very girly and pretty ring then this ring would definitely fit the brief. This wedding set is being sold by VAN RORSI&MO for a very reasonable price. This ring gives off a luxurious and expensive feel and would bring a smile to any ladies face. It is also very much a statement piece due to the volume of jewels featured in this ring. 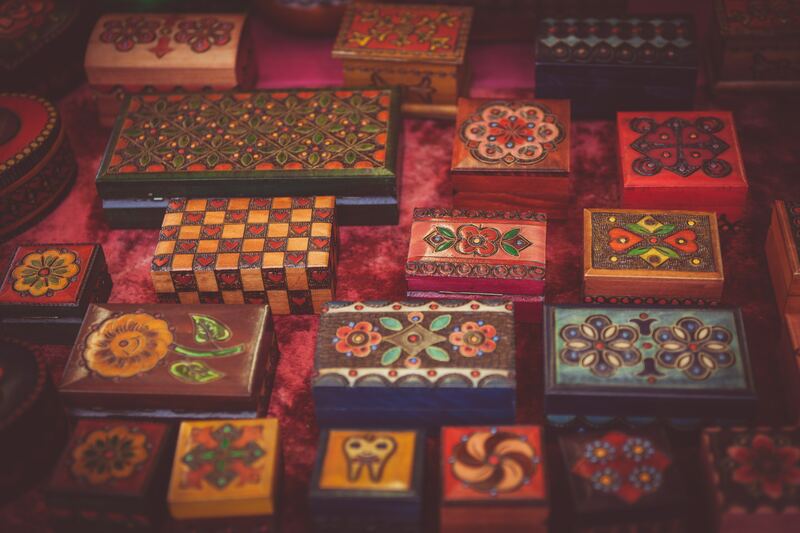 Plus, the set will arrive in an exquisite jewelry box so there’s no need to worry about gift wrap. Looking at VAN RORSI&MO online, you’ll notice there are plenty of pieces to choose from – rings, necklaces and earrings. Take your pick! This beautiful wedding ring set is made up of three pieces of jewelry, an engagement ring, wedding ring and eternity ring. The classic diamond engagement ring has been sandwiched in between two crystal bands, making it stand out beautifully. The engagement ring has a round shaped diamond which is raised on the plain silver band. The two other bands also contain flat diamond strips along the band. 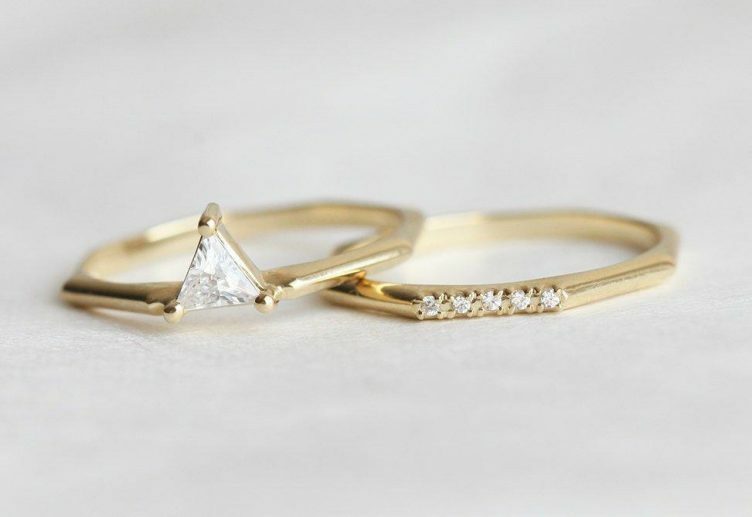 If you like more of a minimalistic look, then this wedding ring set would be perfect! This gorgeous set has been thickly plated with Silvertone over brass. It has also been anti-tarnished, ensuring it has a smooth and shiny finish to the ring. The engagement ring features a round shape cubic zirconia jewel which is approximately 9mm wide and 2.75 carats in weight. If you’re interested in how raised this diamond is, its 11mm wide at the top and tapers down to 7mm at the bottom. We’d definitely call this a classic style ring that has heaps of sparkle. This stunning set has been made by Bridal Ring Bling who has really outdone themselves. This ring is pure elegance! Looking at their jewelry collection Bridal Ring Bling really know how to make wedding ring sets with lots of dazzling diamonds. There’s plenty of sparkle to go around with this jeweler. Their wedding ring sets are also being sold for a reasonable price. Take a look at their collection! Purple, purple and purple! If you’re a lady that loves purple, this rose gold and purple amethyst engagement ring, with matching wedding band, may be what you’ve been looking for! This wedding ring set has been gorgeously designed by BBBGEM who has done a fantastic job. 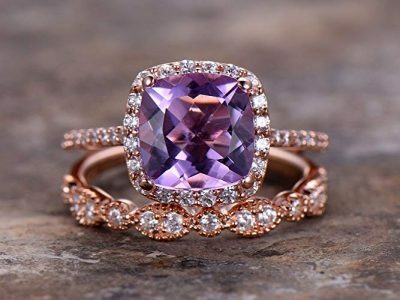 One thing that stands out with this ring is the designer’s decision to combine a purple jewel with a clear diamond on a rose gold engagement band. 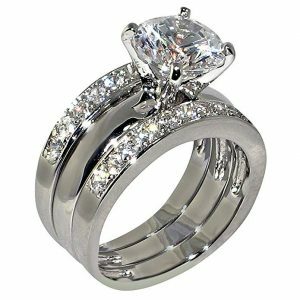 This ring certainly has a modern feel to it and you’ll struggle to find other wedding ring sets like this design. This ring set has been made from a rose gold plated metal. The engagement piece has a stunning 8mm halo shaped purple amethyst which has been framed by tiny cubic zirconia diamonds. The beautiful amethyst has been cut into a cushion shape and has been held in place by a pave setting. The engagement ring which is approximately 2.5 carats has also been paired with a matching band that includes tiny cubic zirconia diamonds. 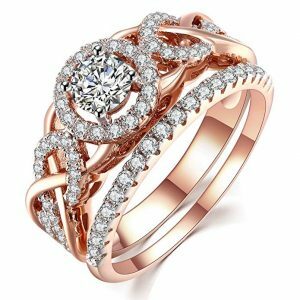 What’s great about this ring is that if you don’t like rose gold metal, this wedding set is also available in sterling silver, white and yellow plated metal. These rings are also stackable rings which give you the option of adding to your wedding ring collection – any excuse to buy more jewelry! You can also tell that this ring has been handmade – the high quality finish and attention to detail really is something special. This pretty wedding set has been made by BBBGEM. If you take a look at their collection, you’ll notice they love creating rings. Rose gold, sterling silver and yellow gold – they offer a variety of different rings that contain elegant sparkling jewels which you won’t be able to take your hands off! Dazzling diamonds! This set designed by Zoe R consists of a gorgeous engagement and wedding ring. The engagement piece includes a sparkling square diamond with a diamond encrusted border about the center piece. Smaller diamonds also decorate this silver band. The wedding band is then decorated with more tiny diamonds which complement the engagement ring. Made from sterling silver, this gorgeous engagement ring has a cubic zirconia halo shaped diamond in the center of the ring that is approximately 6mm wide by 6mm high. The beautiful colorless diamond is mounted on one raised prong and surrounded by 69 tiny cubic zirconia diamonds. The best way to describe this ring would be stylish, classy and chic. These shimmering diamonds are carefully set by hand, giving them more of a defined look. This is definitely a timeless design that will never go out of fashion! It’s hard to believe that this lovely set that has been made by Zoe R is being sold for a low price. It will arrive wrapped in a cute little blue box with a satin ribbon, so there’s not need to worry about gift wrapping because the designer has done it for you. When looking closer at this ring you’ll probably be shocked at the price – as we are! It’s being sold for a fantastic price. If you like this style of ring take a look at Zoe R’s extended collection. They’ve made a collection of gorgeous rings, earrings and pendants, all containing plenty of bling that you certainly won’t forget. Have fun and treat yourself! This set is a statement piece with plenty of sparkle! This beautiful set has been crafted from 14 carat gold and gives off a dazzling high polished finished that will catch everyone’s eye as soon as you walk in the room. Consisting of an engagement ring and wedding band you’ll definitely appreciate the beautiful design work that has gone into this set. The engagement piece contains a sparkling raised diamond in the center of the ring with smaller diamonds either side of the center diamond. The band contains smaller diamonds and a flat diamond strip along the band. When worn together this set could actually be mistaken for one ring. The engagement piece contains a large cubic zirconia diamond which definitely looks like a real diamond. This gorgeous jewel weighs approximately two carats and is held in place by a prong setting. Both rings contain clear and bright diamonds and arrive in a beautiful box. Made by TWJC, this jeweler is known for their large striking sets. If you’ve got a bigger budget to spend and you’re looking for a statement ring set, then you’ve come to the right place. Take a browse of their website! This classy set really is something beautiful. The gorgeous engagement ring includes a large raised diamond in the centre of the ring. It consists of two bands that are covered in smaller diamonds that create a sparkling effect. This sparkling effect then continues along the wedding band. When the two rings are worn together this wedding ring set could be mistaken for actually being one ring rather than two. Made from a 14k sterling silver plated base, this wedding ring set has a lovely shiny and smooth surface to it. The engagement ring features a unique round cut diamond in the center which is surrounded by 46 pieces of 1.2mm zirconia stones, all of which are clear. 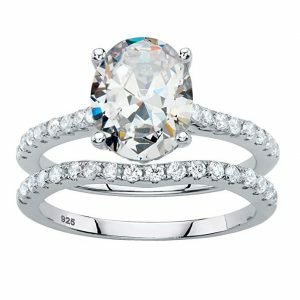 The center diamond is approximately 7mm wide and is held securely in place by a four prong setting. . To match, the wedding ring also features 17 zirconia stones, all clear and around 1.5mm wide. Vibrille’s make a variety of jewelry including sterling silver rings, necklaces, earrings and bracelets. 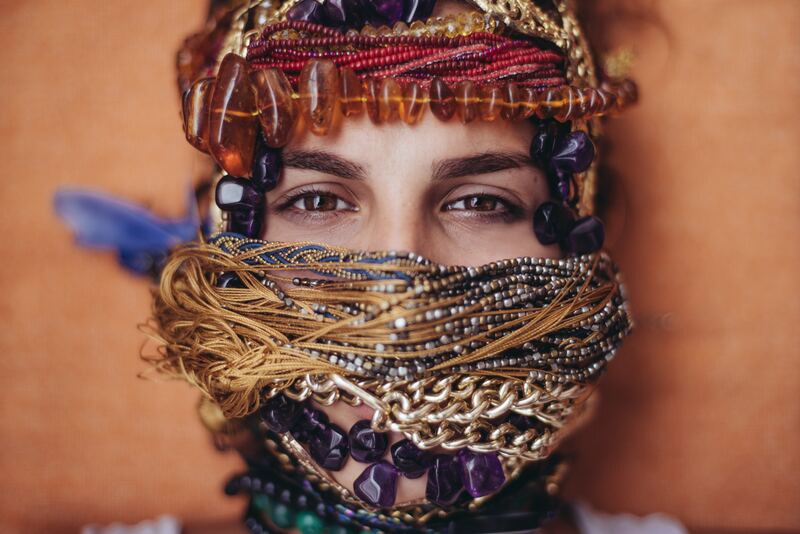 If you like the sound of their jewellery, take a look at their extensive collection now! This set has been made by Vibrille who did a fantastic job. 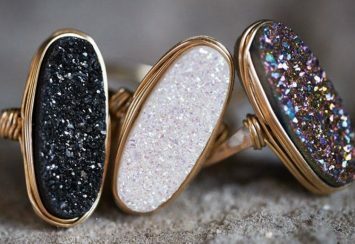 They aim to make affordable and high quality jewelry which are completely unique. Each piece of jewelry has been handcrafted by the team. They also take great pride in craftsmanship and pride themselves in creating breathtaking designs. 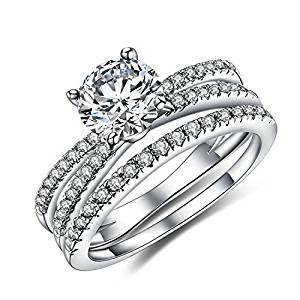 This oval cut white cubic zirconia ring set is a very classy ring. Palm Beach Jewelry has done a fantastic job with creating this elegant ring. 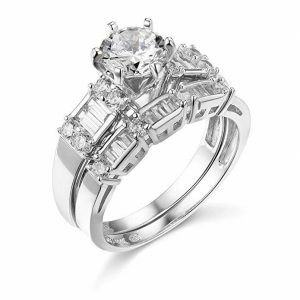 This set consists of an engagement ring which has an oval stone in the center of the ring. Smaller diamonds are then featured along the ring’s band, creating a sea of beautiful gems. The wedding piece has a smaller indentation in the center of the band which allows the engagement ring to fit and be worn snug against one another. The wedding ring band is full of small dazzling diamonds which look wonderful worn alongside the engagement ring. This set has been made from a beautiful platinum sterling silver metal. The set will not only be very durable but will also prevent from tarnishing. The center stone on the engagement ring has also been cut into an oval shape. Even though it looks like it contains a real diamond it is in fact a cubic zirconia gemstone which is held securely in place in a prong setting. Altogether, the two rings contain 53 cubic zirconia stones – which equals a lot of sparkle! This stunning set has been made by Palm Beach Jewellery. Their gorgeous collection consists of rings, necklaces, pendants and earrings. Browsing their collection, they offer a variety of jewelry to appeal to everyone -yellow gold, white gold, diamonds, gemstones and sterling silver charms. You want it, they have it. This wedding ring set is also being sold at a low price. Take a look at their collection now! Wow! Look at this – it really is something special that you won’t be able to take your eyes off once you put it on! 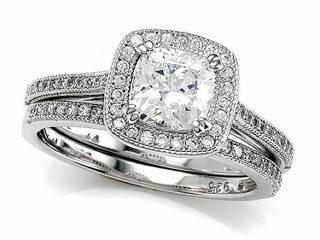 It consists of a breathtaking engagement ring and matching wedding band that looks gorgeous together. The engagement piece consists of a square diamond encrusted center with layers of sparkling diamonds that are truly unforgettable. The engagement band follows a crisscross design that draws your eyes to the centre diamond of this ring. The wedding ring band has then been cleverly designed so it cushions the engagement ring and when worn together looks like one ring. 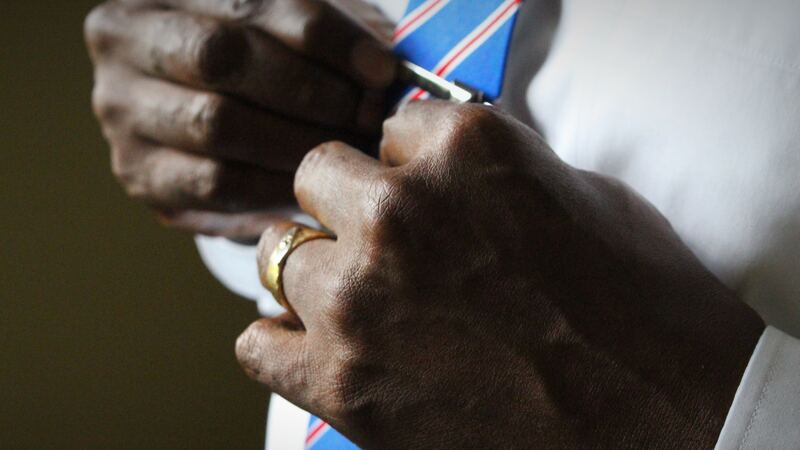 The attention to detail that has gone into this wedding band is really something quite special! This beautiful set has been made from 14k white gold. 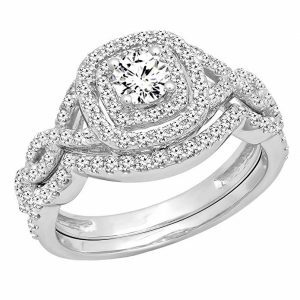 The engagement piece consists of a swirl diamond halo setting which holds a round white diamond in the center of the ring. The main diamond of the engagement ring is approximately 11.55mm wide by 24.45mm in length. The total stone weight consists of one carat. The wedding ring band has also been designed to sit alongside the engagement ring beautifully which contains lots of shimmering diamonds. This set that has been crafted by Dazzling Rock which has a very classic and contemporary feel to it. The set has been designed by the team to suit an everyday occasion. If you take a look at their website you will notice that Dazzling Rock make a variety of jewelry including pendants, bridal rings, necklaces and pendants. What’s great about this ring is that it gives off a modern vibe. The designer also offers a collection of jewelry ranging from vintage designs to a more modern look. When it comes to the price this Dazzling Rock wedding set it is being sold for a very high price, however we think its definitely worth every dollar! Black, black and more black! This black gold sapphire ring is really something very unique and unusual! You won’t find this wedding ring set anywhere else. The engagement piece consists of a large square shaped black diamond in the center of the ring. Along the engagement ring band features reflective diamonds ranging in sizes. These complement the center piece and work in making it stand out beautifully. Next we have the wedding ring band that contains diamonds along three sides of the ring. These smaller diamonds make up the entire wedding ring band and when worn alongside the engagement, the two rings look gorgeous together! The set has been created by using a rhodium plated base metal. Not only does the rhodium make this set very strong but also prevents it from tarnishing. The engagement ring includes a striking 1.5 carat stone which acts as the main stone within this unusual ring. 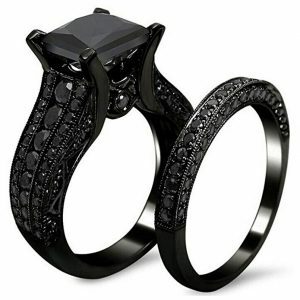 There are then 150 additional smaller black stones that make up this stunning ring. If you’re looking for a unique ring with plenty of personality, this is it. Alongside the rhodium plated base metal, this ring has also been created using an 18k black gold plated metal. The large centre stone may look like a really black diamond but it’s in fact made from a high quality cubic zirconia stone. This gemstone has also been cut into a classic sapphire princess cut which looks utterly gorgeous! If you love the gothic look, this piece and match wedding band, could be exactly what you’ve been looking for. The beautiful set offers a classic vintage retro gothic look and represents the feeling of loyalty, love and friendship. If you feel the deep black gothic look is too dark for you, this set can be purchased in a blue rhodium plated metal as well. You’ll notice alongside the black colored metal, these blue cubic zirconia gemstones really stand out and even look like the midnight sky. Take a look at both color options and see which one you prefer! The set has been cleverly designed by AMiERY. When browsing their collection, you’ll notice they have a particular love for wedding ring sets. In particular those that are big, bold and full of jewels. Black, blue and silver – this jeweler doesn’t hold back with incorporating colored gemstones into their designs. You’ll also notice that the designer prefers square shaped jewels over round! This particular engagement ring and wedding ring band is being sold for a low price so why don’t you take a look on their website and grab yourself a bargain! We love our rose gold jewelry so much we decided to include this gorgeous wedding ring set as the final set in our top ten list of must have rings! If you thought our other wedding sets were lacking detail, you most definitely won’t think this with this intricate engagement and wedding ring. This stunning engagement piece consists of a circular diamond in the center of the ring surrounded by a band of smaller diamonds. This circular theme is then incorporated in a decorative design throughout this ring, almost in a loop design. Some of the circular loops include diamonds and some consist of plain gold rose metal. To complement this engagement piece, the designer has chosen to include a single rose gold wedding ring band that includes smaller shimmering diamonds half way along the band. 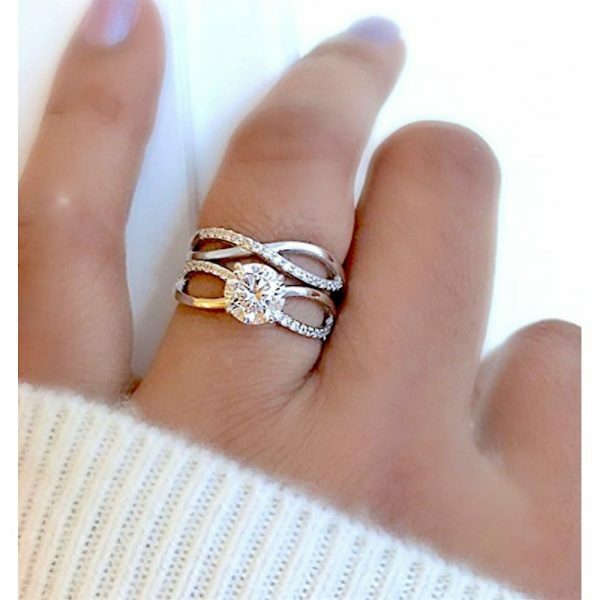 While sat together on your finger, these two rings will look utterly perfect together! The set has been crafted from sterling silver with a 4k rose gold plated metal on the surface. There’s no doubt that this twist shank bridal set will glitter with love when worn by the love of your life. The center diamond may look like the real thing but in fact it is actually a cubic zirconia gemstone which has been held in place securely by a four prong setting. There are a total of 70 additional stones that feature in this engagement ring – wow, that’s a lot of shimmer. The jewels have also been cut to a round shape and are a white color which stands out and looks gorgeous alongside the rose gold metal. When worn, the set gives off a modern vintage vibe which is truly unforgettable! Whether you like the quality of the stone, the exquisite design or the flawless cut, this designer has put a lot of time and effort into creating this beautiful piece of jewelry. This set has been made by GuqiGuli. If you take a look at their collection they sell rings, pendants, earrings and necklaces. Ranging from yellow gold, rose gold and white gold, this jeweler loves designing a variety of jewelry using different colored metals. Treat yourself to a piece from their extensive collection – you won’t regret it at all!